The Supreme Court-appointed judicial commission on water quality and drainage in Sindh on Friday ordered municipal authorities in Karachi to dismiss all Muslim sanitation workers from service after being informed that the employees refuse to do jobs such as cleaning sewers. 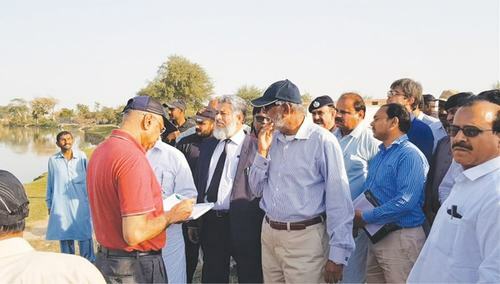 Retired Justice Amir Hani Muslim, who heads the one-member commission, observed at the outset of the hearing that the city's central district was littered with garbage. He asked District Municipal Corporation (DMC) Central Chairman Rehan Hashmi how many of the district's 1,200 sweepers were Muslims. When Hashmi disclosed that nearly 200 of the sanitation workers were Muslims, the judge asked whether those employees also clean gutters. The DMC chairman replied that they did not, upon which the judge ordered him to dismiss those sanitation workers from service. Justice Muslim remarked that municipal matters of the city will suffer if appointments are made on a political basis. Hashmi claimed that his office lacks the resources and machinery to rid the city of garbage completely. Local Government Secretary Ramzan Awan informed the commission that as many as 50 per cent of DMC employees don't show up to work. "Political appointments are common in Karachi," he said. Awan also revealed that around 1,380 DMC workers out of a total of 13,000 had turned out to be ghost employees. Before adjourning the hearing until April 5, the commission ordered the Sindh Solid Waste Management Board and the Cantonment Boards to ensure through their contractors and employees that "all the solid municipal waste is removed from the city starting from today". The deputy commissioners were ordered to supervise the removal of waste from their districts. "The heaps of garbage all over in Karachi shall be cleaned and cleared," the commission declared, according to a copy of the order sheet. Earlier this month, Chief Justice Mian Saqib Nisar had expressed his displeasure over the heaps of garbage that have become a regular feature of Karachi's cityscape and ordered the authorities to ensure that all trash is removed within the week. "I want a neat and clean Karachi within a week," CJ Nisar had ordered on March 17 while hearing a citizen's rights case concerning Sindh's water and sewerage problems in the Supreme Court's Karachi registry. During the proceedings, Justice Nisar had recalled that Mayor Akhtar was supposed to resolve the garbage issue. The city mayor, who was present for the proceedings, had put the onus of responsibility on the provincial government, reiterating his earlier stance that all his powers in this regard had been shifted to the government. Why only non muslim have to do cleaning job aren't we all humans the same. Good decision by KMC, hope justic will prevail. It would have been nice had he asked them to take proper measure to dispose off the garbage and not to burn it or throw it in the ocean. I am afriad that is what the city will do now. Where is it forbidden in Islam to clean the sewerage? It is generated by us and we pay to the workers for its disposal. Any one who thinks himself above the cleaning of the same has no right to be employed against a job meant for the sewerage cleaning. They deserve to be ousted from the service and any salaries paid to them in the past for the said jobs which they never performed must be returned to the government. It's a dirty job. But somebody has got to do it! If sewer cleaning is included in the job description, then they should not take the job if they don't want to do it. Sir kindly look at other districts of Sindh too. It's a very good move indeed. However, I just hope that the garbage are properly and completely disposed off, not shifted so some other place or disposed off in a way that would harm the nature and the environment. SC should seriously consider this, if not already. Hope the very best for Pakistan. Let Karachi be governed Karachites and affiliated to no political party. Then see Karachi rise to a tourist city. Right decision ! Immediately terminate those who refused ! millions of youths are jobless and ready to do any work! Influence of political parties in public institutions have worsen all setup. Ban all influence of political parties in all govt institutions. That's the way to solve problems . I hope the court keeps the pressure on. Please please all powers be shifted to the city level government. Sewer and garbage is a city problem and not provincial. The progress be reported on daily basis. The judiciary should create a system that work effeciently and the culprits be punished. No punishment no change.